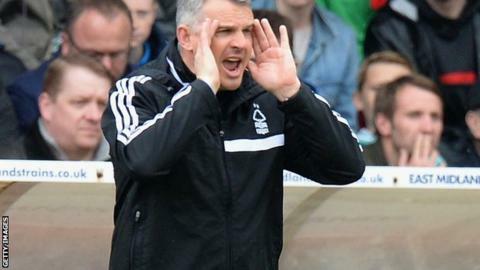 Caretaker boss Gary Brazil says Nottingham Forest will spend the remainder of their season trying to restore their pride after Saturday's 5-2 loss at Queens Park Rangers. Now winless in 12 league games, Forest sit five points outside the top six. "It makes it very hard [to reach the play-offs] - we are going to have to win all our remaining games and rely on some others losing," said Brazil. "We've to get some pride back for ourselves and this football club." The play-off ambitions of the 11th-placed Reds could still fade further on Monday if Reading beat already promoted Leicester to move back into the top six and open a seven-point gap to Forest. Former Forest captain Stuart Pearce, who will take over as boss from Brazil on 1 July, was in the stands at Loftus Road to watch their latest setback. QPR scored three goals in the last six minutes to deny the Reds a point after they twice fought back from a goal down. "Everyone is look forward to Stuart coming in, but we don't want the season to just peter out and end without us showing some quality before we come to the end," Brazil told BBC Radio Nottingham.